As time marches on, birthday parties are becoming more and more of an occasion. With the prevalence of the Internet these days, niche and specialty items are starting to become widely available. This is great news for anyone planning a birthday party for a child, as it means that there are options for entertainment that were simply not available in most parts of the country. Smaller boutique shops can export their goods easily using the Internet, which means that birthday parties around the country have some pretty excellent decorations available. Balloons are one area that has grown a great deal in recent years. It used to be that when someone was planning a birthday party the question was what color of balloons would be used. Some also used air to inflate balloons while others used helium. Still, the limit of the selection was what was available at the supermarket. Any theme balloons were generic at best, limited to vague "Happy Birthday!" or "Happy Graduation!" type messages. Now that anyone can order supplies from anywhere online, this has changed a great deal. Instead of the boring old supermarket selections, balloons of all shapes and sizes are just a click of the mouse away. Buying a four foot talldinosaur balloon is now possible without any serious time spent hunting around for it. This is great news for supporting parents everywhere, as now it is possible to encourage the creativity and sense of wonder that many children attach to dinosaurs. 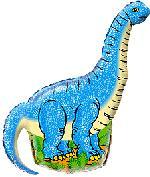 Throwing a dinosaur themed birthday party is a great way to get any child's love of learning reignited. Dinosaurs are so fascinating to children and adults alike that any party themed around the majestic creatures is sure to be a hit for the kids and parents present. Finding a company that makes giant dinosaur balloons could not be easier. A simple search would turn up a number of balloons that are perfect for any party. Most of these balloons ship promptly to any address, though they do not come inflated. They are large, but any party supply store or even many local grocery stores will be able to inflate them with helium so they float. If one does not want to go to the trouble of finding helium, or are concerned with the balloons floating away, he or she can inflate them with air without any special pumps, just be warned that it is going to take a while due to the sheer size of the balloons. With the giant balloons and a nicely themed cake in place, all that is needed to complete the party decorations is great paper plates or napkins, which can be found online or at any local party supply store. Once all the themed items are assembled, a party to remember can be created. It should be said that these dinosaur balloons are absolutely enormous, and will be the featured attraction at any child's birthday party, and they are durable enough that they are sure to last the whole time.